1. Key to the door. He did this as a memorial to his two nephews Robert Huntriss Tolson and James Martin Tolson both killed fighting in the First World War. 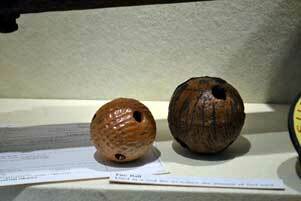 At the time there was a burgeoning museum in the Technical College but woefully restricted by space. 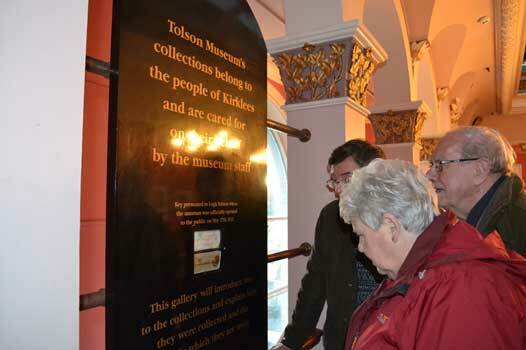 Mr Tolson made the donation on condition that the museum should reflected the history and environment of Huddersfield as suggested by Dr Woodhead, the Head of Biology at Huddersfield Technical College. It should be open to the public and demonstrate ‘the influence of all life of the town and district. It should be an educational institution and should provide practical illustrations of the main factors in the environment of the community.‘ As it does to this day. 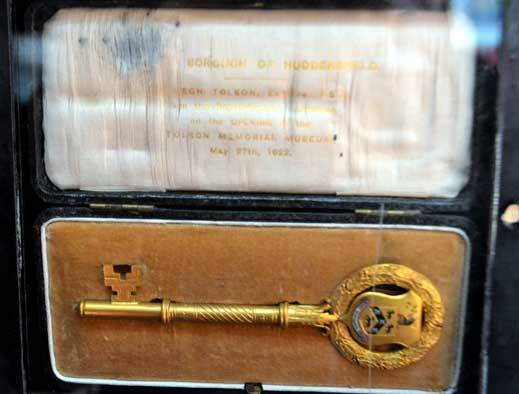 On 22nd May 1922 Legh Tolson was presented with a gold ‘key to the door’ of the Tolson Museum. You can see this on the first floor landing. 2. Fire Balls, a very local product? Or is it? They don’t explode. They cut down on the domestic cost of coal. Shallow coal mining was important with as many as 50 mines in the Huddersfield area and fired the industrial revolution locally. But at home it was an expensive commodity so fireballs made of hardened clay were placed in the grate to reduce the amount of coal needed and yet retain the warmth. 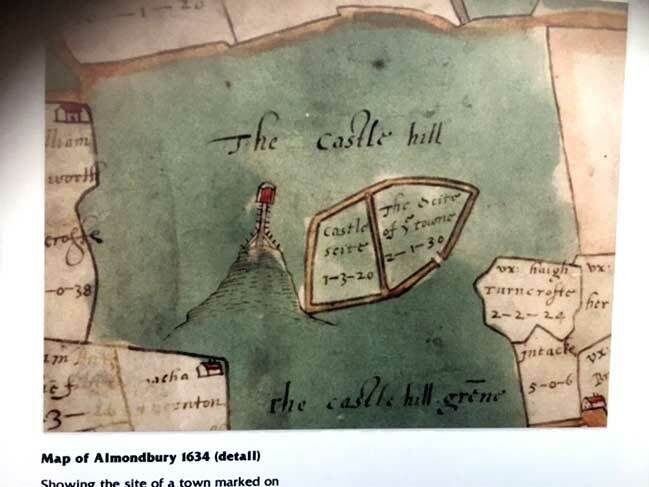 This map of Castle Hill is part of the 1634 map of the Township of Almondbury. It is the ‘scite of the towne’ with the warning beacon. The history of the occupation of the hill, with models, fills a room in the Museum. Boards illustrating this are also found on Castle Hill. 4. 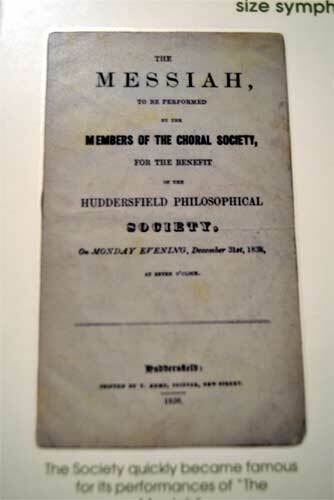 Programme from a concert given by the Huddersfield Choral Society 1838. The Choral Society was founded in 1836 at the Plough Inn and is famous throughout the UK. It’s 200 members give four home concerts a year plus upwards of four invitation home and abroad. Music is so important to people in the Huddersfield Area. There are choirs, brass bands and orchestras throughout the town and local villages. 5. 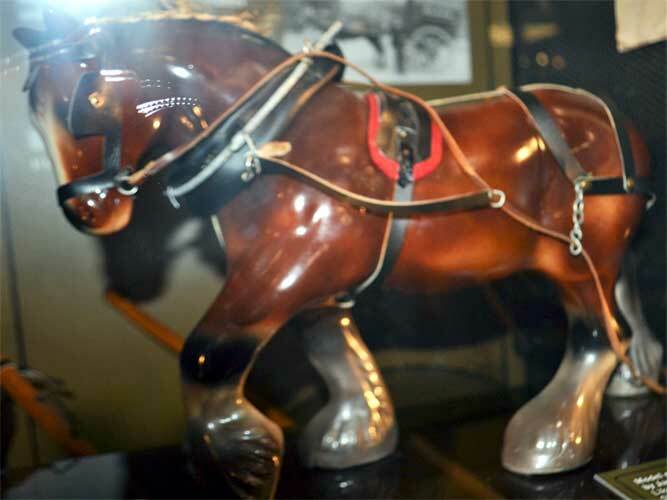 Model of a Carthorse, possibly called Charlie, by Jack Moon. Ben Shaws who make fizzy drinks, once had a fleet of horse-drawn carts. They kept four horses for this work. This model and the cart were made in about 1900. 6. Fancy Hand Woven Fabric. One of many examples of the complex design fabric made in Huddersfield. This was designed by William Etchells about 1850 and was produced by George Senior & Sons, Lower Mill Hill, Dalton. The fancy trade used threads unusual to the West Riding such as silk. 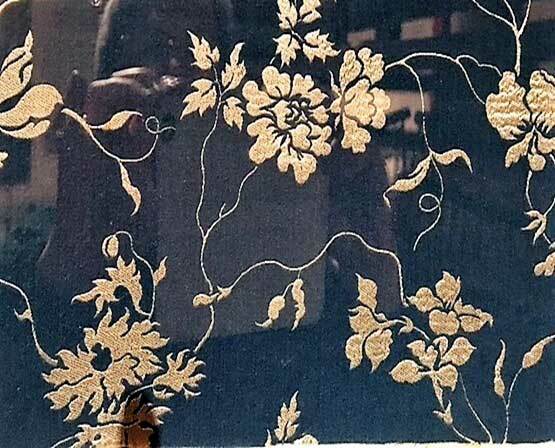 Fancy trade cloth could be made into waistrcoats, fancy dress materials, soft furnishings of all kinds, shawls and table covers. Surely the most famous pig in town! The Museum collection of half animals includes a horse, cow, sheep , goat, cat and the pig. These animals were acquired from Gerrards taxidermists and are divided in two to show the complete body on one side and the skeleton on the other. The pig and the horse can still be seen in the Community Room. 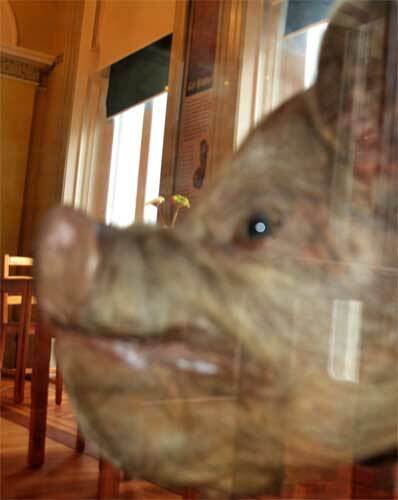 The pig is a ‘charming half pig, residing at Tolson Memorial Museum , portal to adventures in time & space, since 1924. He loves history & meeting people. Not creepy, honest. ( according to his twitter account). Sadly ,though much loved and remembered, he hasn’t acquired a name!. Any suggestions? 8. David Brown Valveless Car. 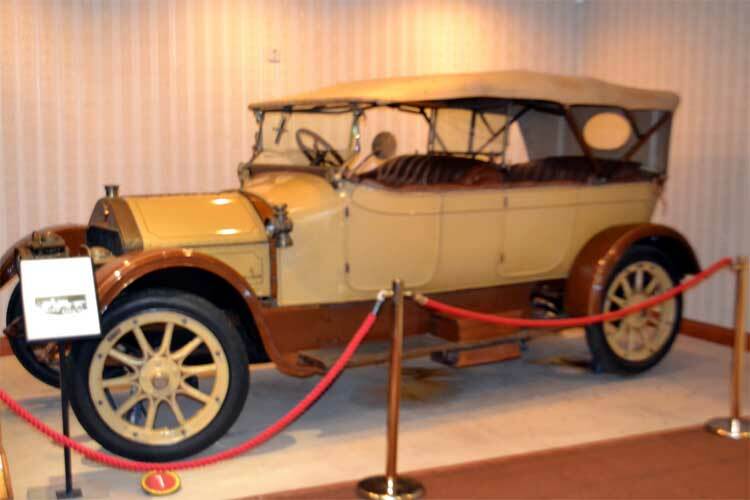 The ‘Valveless’ car was manufactured between 1908 and 1915 by David Browns Gears of Lockwood, Huddersfield. In many ways it was typical of pre-WW1 cars; large and expensive, with an emphasis on individual craftsmanship of a high standard. Valveless cars were comfortable, quiet and smooth running. Their ruggedness and hill-climbing qualities made them especially popular amongst the pioneer colonial motorists in Africa and Australia. Their solidity is demonstrated by the result of a collision between a Valveless and a Bradford tram. The car escaped with a scratched wheel, but the tram had to be towed away with a broken axle-box. Ravensknowle Hall designed by Richard Tress of Tress and Chambers and built between 1859 and 1861. 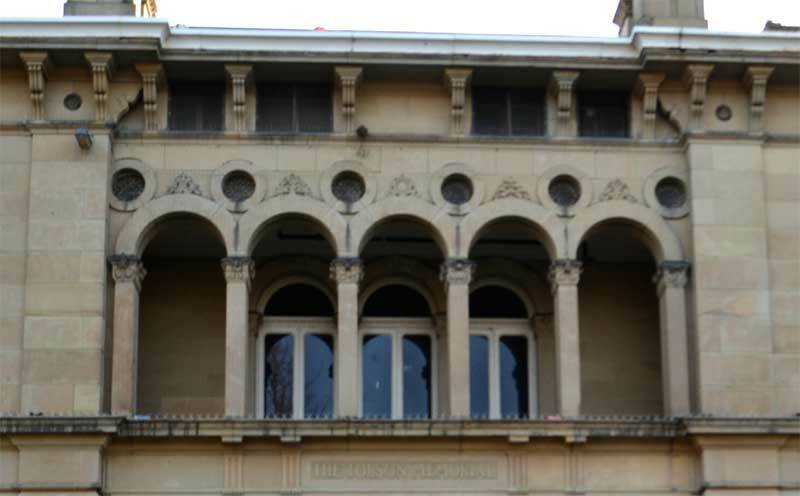 An unusual feature of this building is the Italian style ‘loggia’ above the main entrance. Perhaps this is rare in this area as the climate in this part of the world does not often lend itself to enjoy sitting outside! Ravensknowle Hall became Tolson Museum when the house was given to Huddersfield Corporation 31st December 1919. 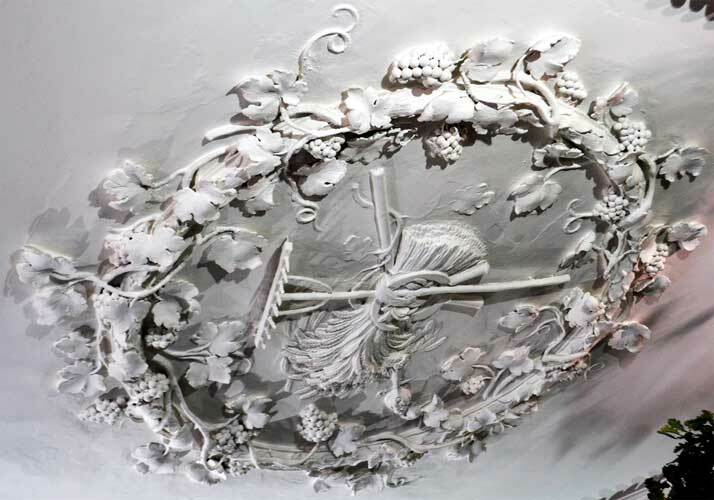 This ceiling was created in the 1740s by James Paine. It was originally in the dining room or small drawing room in Whitley Beaumont. This was removed when the house was demolished and installed in Tolson Museum in 1951 who paid £12.50 for this and the stag and leaf ceilings.